Cardiff Jump Children's Activity CentreCardiff Jump has enormous adventure play-frames: a space zone, a galleon and an enchanted castle. 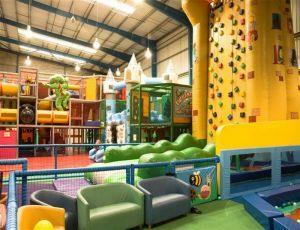 At 27,000 sq feet it is the largest dedicated indoor soft play centre in the UK! The Centre offers huge inflatables, an indoor football pitch, ten pin bowling and an enormous zone just for toddlers. Cardiff Jump also offer themed party rooms, a café and different activities every day. At Jump, children are free to be as energetic and active as they wish. In this safe but exciting environment, they develop physical and social skills, co-ordination and balance and at the same time their imaginations run wild. By Car: Exit the M4 at Junction 32 and follow the signs for the A470 towards the city centre. Continue along this road until you come to a junction with a Wetherspoons pub in front of you. From here, take the first turning on the left which will bring you onto Caerphilly Road. Follow this road up until you come to a small roundabout and then take the third exit onto Ty-Glas Road. Take the first turning on the right hand side and then the first right again into Parc Ty Glas.